Join us for a weekend to celebrate the amazing spring bird migration here in Duluth, MN. Public education programs (migration interpretation & kid’s activities) at the West Skyline Spring Count, Spring Migration Workshop, Saturday Evening Presentation by Carrol Henderson (retired director of MN DNR Nongame Wildlife Program, author, and well known for restoration efforts for Peregrine Falcons, Trumpeter Swans, and Bald Eagles), and birding field trips to be offered. General information about the Hawk Ridge Spring Count can be found HERE. Discounted prices for Hawk Ridge Members, MN Master Naturalists and Students! LODGING: Discounted rates available at Radisson Hotel Duluth-Harborview. Call 1-800-333-3333 to book your room with mention of “Hawk Ridge Birders” rate under account 165340. Sunday-Thursday (King or 2 Queen Beds): $79/night and Friday-Saturday (King or 2 Queen): $99/night. WEATHER: Inclement weather can impact (postpone/cancel) public program activities taking place at the West Skyline Spring Count. Registered field trip and workshop participants will be contacted by trip leaders for any changes. *Our West Skyline Spring Count location changes with the wind – see below. In S, SW, SE, N, NW or W winds: Enger Tower. Directions: From Hwy 35, take the Hwy 53 North exit (255A) in Duluth and continue on Hwy 53 North / Piedmont Ave to the stoplight where Piedmont Avenue splits off. Turn LEFT onto Piedmont Avenue, drive 1 block and turn LEFT onto 24th Ave West, then drive another block and turn LEFT onto West Skyline Parkway. Continue past the Enger Golf Course on West Skyline Parkway to a pullout overlook just below Enger Tower (marked with a sign, “Rice’s Point). You’ll come to West 5th Street if you go too far. If you don’t see anyone at the overlook with binoculars, try the Thompson Hill site. Parking available at Enger Tower Park, and Twin Ponds both a short walk from the count area. Feel free to drop participants at Rice’s Point and then park and return to the count area. In NE or E winds: Thompson Hill. Directions: From Hwy 35, take the Boundary Avenue exit (249) and cross to the north side of the freeway. Turn RIGHT onto West Skyline Parkway as if going to the Thompson Hill Rest Stop. Drive past the first rest stop entrance to the overlook directly below the rest stop. (You’ll come to the second rest stop entrance if you go too far.) Parking available in the Thompson Hill Rest Area. Feel free to drop participants then park and return to the count area. 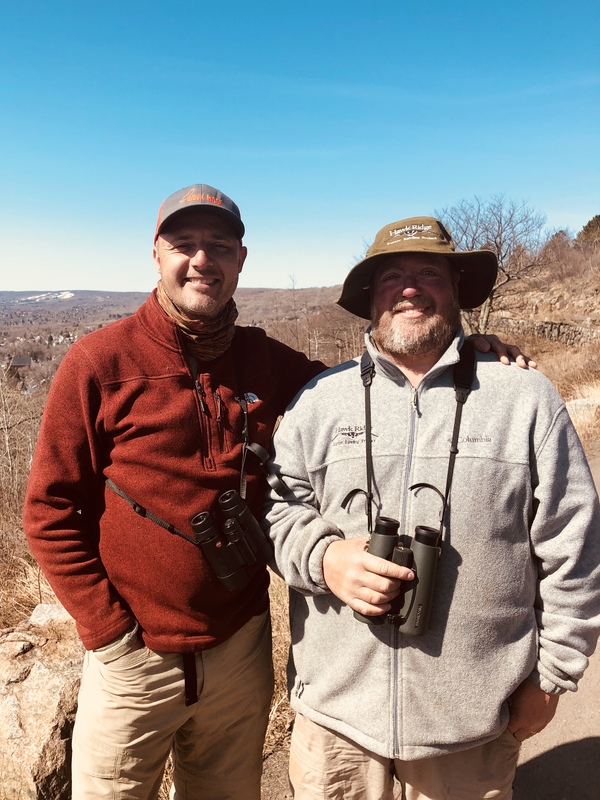 We invite you to please sponsor Frank Nicoletti & the Hawk Ridge Spring Counters in the 2019 Raptorthon to support Hawk Ridge Bird Observatory and Hawk Migration Association of North America (HMANA)! were counted, which was the second highest total in the history of WSHC with 33,228 in 2004. On March 21st of this year 2019, we also broke the North American 1-day high count of Bald Eagles with a total of 1,076! Again, 50% of your contribution will support HMANA, and 50% for Hawk Ridge, so join us and see if we can gain top ranking for species diversity in North America! Results of the Raptorthon are published each year in the Hawk Migration Studies Journal. 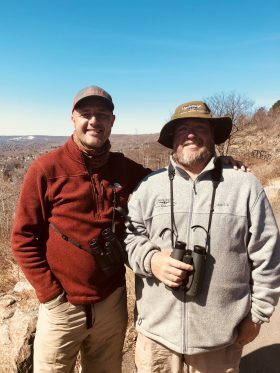 We thank you in advance for helping us raise money to support both Hawk Ridge & HMANA’s efforts in raptor conservation, monitoring and research programs! Hawk Ridge Bird Observatory is happy to be a participant in the Duluth Community Day offerings, in partnership with Visit Duluth and the City of Duluth. You can check out other Community Day offerings at communityday.visitduluth.com. Join Hawk Ridge staff to celebrate the amazing spring bird migration and International Migratory Bird Day! Free outdoor public education programs (songbird banding, migration interpretation & kid’s activities) will be taking place at the West Skyline Hawk Count run by Hawk Ridge Bird Observatory. Schedule of activities, directions, and inclement weather locations are listed below. Hope to see you there! Hawk Ridge staff band thousands of birds through the year. What can we learn from a bird in the hand that we can’t see from watching them in nature? Find out from staff and learn about the science involved in banding. We will take a closer look at some of the songbirds in the area to learn more about who they are, where are they coming from, and where are they going. This activity will be ongoing through the morning, so stop in for a bit and see what we’re catching. This activity is weather dependent, as rain and high winds may interfere with our ability to do this. Watching birds is just as much fun for kids as it is for adults! We have lots of ways to learn more about them. We will have a variety of kid-friendly activities available – make a bird mask, or your own special binoculars, or take off on a scavenger hunt and see what you can find. Grab a Junior Birder Raptor guide and take off on a learning adventure about raptors. We will have staff and volunteers available to help with these activities through the day. Did you know that Duluth is one of the premier spring migration places in North America? Spring and fall are both amazing times of year to view the bird migration! 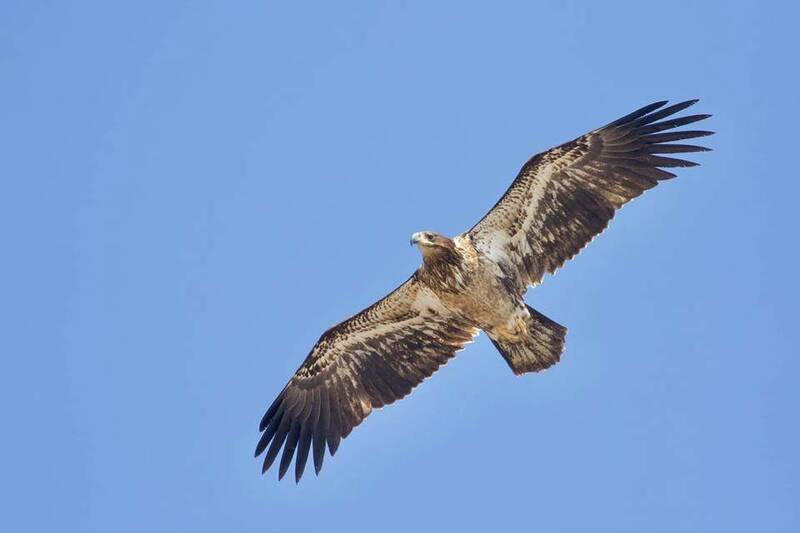 Join us for an exploration of who’s currently flying through, figure out who is related to who through artifact wings and talons, and find out how flight behaviors can help us identify the raptors as they fly by Duluth on their way to nesting territories. Let’s take a hike and see what we can find for bird activity in the area. We will certainly keep an eye out for birds migrating past, but what else is happening? Who’s already nesting, who’s just arriving, who’s been here for a while and has a good head start on nesting and raising young? There is a lot going on in the life of birds at this time of year. Join a Hawk Ridge Naturalist for this Quest and who knows what we will find! Directions: From Hwy 35, take the Hwy 53 North exit (255A) in Duluth and continue on Hwy 53 North / Piedmont Ave to the stoplight where Piedmont Avenue splits off. Turn LEFT onto Piedmont Avenue, drive 1 block and turn LEFT onto 24th Ave West, then drive another block and turn LEFT onto West Skyline Parkway. Continue past the Enger Golf Course on West Skyline Parkway to a pullout overlook just below Enger Tower (marked with a sign, “Rice’s Point). You’ll come to West 5th Street if you go too far. If you don’t see anyone at the overlook with binoculars, try the Thompson Hill site. The activities above are weather dependent. If there is rain, snow, or high winds, we will be located at either the Enger Park pavilion or Thompson Hill Rest Area pavilion next to visitor center. You can find out which location we will be at the day of by checking our Facebook page or home page of our website at www.hawkridge.org. Spring Migration location varies depending on direction of wind, as noted in directions above. Come and celebrate the fall bird migration with us! Hawk Weekend is the annual festival held by the Hawk Ridge Bird Observatory in Duluth, MN. It is a wonderful opportunity to showcase one of North America’s best places to experience the fall bird migration at Hawk Ridge Nature Reserve. There will be a variety of field trips, hikes, programs, and activities for all ages! 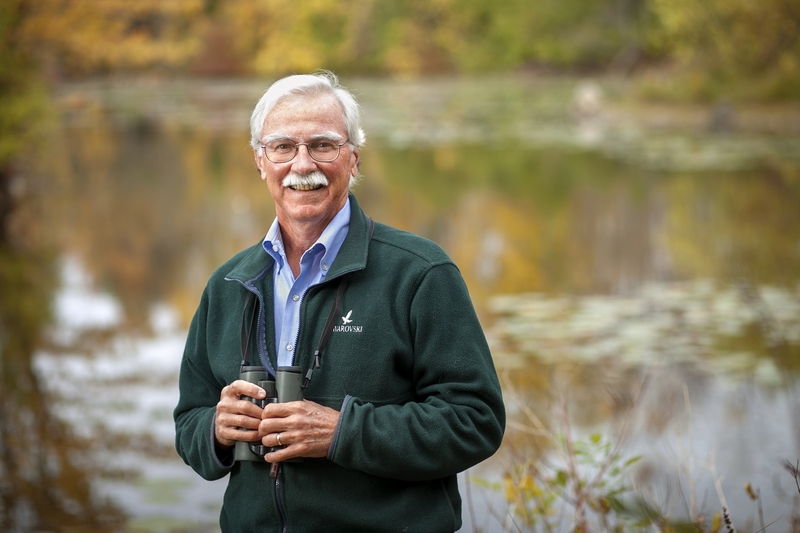 We’re also excited to announce our Saturday evening guest speaker will be John W. Fitzpatrick, Executive Director of the Cornell Lab of Ornithology. He will present “How Birds (Including Hawks!) Can Save the World”! Registration and more info coming late spring/early summer! Come and celebrate the fall bird migration with us! Hawk Weekend is the annual festival held by the Hawk Ridge Bird Observatory in Duluth, MN. It is a wonderful opportunity to showcase one of North America’s best places to experience the fall bird migration at Hawk Ridge Nature Reserve. There will be a variety of field trips, hikes, programs, and activities for all ages! Please join us for an inspirational & important evening in celebration and support for Hawk Ridge Bird Observatory. Enjoy a delicious dinner, complimentary beer (while it lasts! ), cash bar, live music, live education birds, nature & artwork fundraiser. We’ll share highlights from the spring & fall bird migration, other exciting news, and end the evening with a fantastic guest speaker. Scott Weidensaul, ornithologist and author, is well known for his over 2 dozen books, including Living on the Wind: Across the Hemisphere with Migratory Birds, and owl migration research through Project SNOWstorm and Project Owlnet (www.scottweidensaul.com). Registration and more info coming late spring/early summer!